I apologize for my delay in posting these stops, but I’ve had a crazy couple of weeks with the book launch party and with the various pieces I’ve been working as part of the ‘tour’. The Guardian newspaper (UK) also asked me to write an article for them that is scheduled to appear May 11th. The Little Bookroom Guide to Paris with Children will be released May 16th in the UK. I’ll post a link when it’s up. One thing I’ve learned for the next time around is to book more time in between stops! “Paris is on our list of ‘must-visit’ destinations. Not only is it one of the most romantic cities in the world, rich with history, art and culture, it happens to be part of my husband and children’s lineage. Visiting Paris would be a trip of a lifetime for our family and it’s something we want to do while the kids are still young. “Planning on traveling internationally with your kids? The planning process can be quite daunting! Travel guides, reviews and expert advice are your best friends! 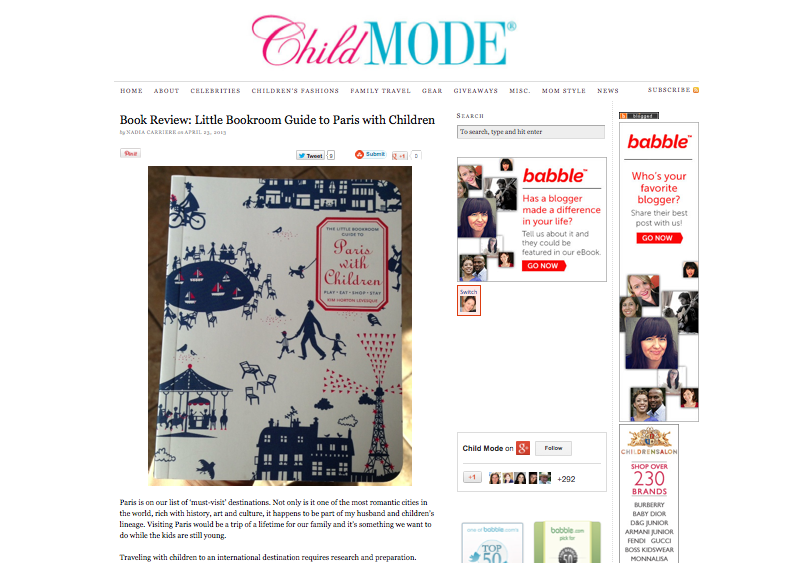 I recently had the chance to review Kim Horton Levesque’s new book The Little Bookroom Guide To Paris With Children. “Readers of my Paris book likely know of Kim Horton Levesque, who wrote an indispensable book called Pampered in Paris: A Guide to the Best Spas, Salons and Beauty Boutiques (The Little Bookroom, 2010) — I featured this terrific book under the ‘Spas’ entry in my A to Z Miscellany. Kim’s been busy since that book was published, and her newest project is Paris With Children (also published by The Little Bookroom, one of my very favorite book publishers in the world). I’m pleased and honored to participate in Kim’s official blog tour this season.